How to Be a Latin Lover is a 2017 American comedy film directed by Ken Marino, written by Chris Spain and Jon Zack and stars Eugenio Derbez, Salma Hayek, Raphael Alejandro, Raquel Welch, Rob Riggle, Rob Huebel, Rob Corddry, Renée Taylor, Linda Lavin, Kristen Bell, and Rob Lowe. The film follows a man who has spent his whole life married to a rich old woman, and must learn to make it on his own when she kicks him out. It was released on April 28, 2017 by Pantelion Films and grossed $61 million worldwide. Having made a career of seducing rich older women, Maximo marries a wealthy woman more than twice his age. 25 years later, spoiled, out of shape and bored from waking up next to his now 80-year-old wife, he gets the surprise of his life when she ends up dumping him for a younger McLaren car salesman. Anxious to return to the lap of luxury, Maximo uses his nephew’s crush on classmate Arden to get to his new target: her grandmother, Celeste (a widowed billionaire that Rick is also targeting). Maximo tries to reignite his charm as a Latin lover, and fails at it miserably. Sara comes to know of Maximo's scamming and kicks him out. While teaching Hugo some tricks he thinks work on women, Maximo finds himself bonding with his nephew, and this opens his heart to being less selfish and more thoughtful of others. Eventually, Maximo becomes a gigolo for the woman Rick used to live with, and he patches up the relationship with his sister and nephew. Salma Hayek as Sara, Maximo’s estranged sister. Raphael Alejandro as Hugo, Sara’s nerdy and adorable son and Maximo’s nephew. Rob Lowe as Rick the Gigolo, Maximo's equally wealthy friend. Kristen Bell as Cindy, a lonely and single woman, who works at a frozen yogurt shop and lives alone with her dozens of cats. Raquel Welch as Celeste Birch, Maximo's target and Arden’s grandmother, whom Maximo tries to seduce in order to live a life of luxury once again. Renée Taylor as Peggy, Maximo's wealthy, but elderly, wife. She leaves Maximo for an unattractive and younger car salesman. Rob Corddry as Quincy, Celeste's chauffeur. Mckenna Grace as Arden, Hugo’s crush. Mather Zickel as James, Sara's love interest. Michaela Watkins as Gwen, Sara's boss. Michael Cera as Remy, a sleazebag car salesman. On June 5, 2015, it was announced that Eugenio Derbez and Benjamin Odell's Santa Monica-based production shingle 3Pas Studios and Televisa/Lionsgate joint venture Pantelion Films had bought an untitled original comedy script from Chris Spain and Jon Zack, with Lionsgate releasing under its first look deal. On October 26, 2015, Ken Marino was attached to direct the film, starring Derbez. On April 28, 2016, Rob Lowe, Kristen Bell, Raquel Welch and Rob Riggle joined the film's cast along with others including Renée Taylor, Rob Huebel, Michaela Watkins and Linda Lavin. On May 11, 2016, Mckenna Grace joined the cast. The first trailer was released on December 21, 2016. The film was released on April 28, 2017 by Lionsgate's Pantelion Films. 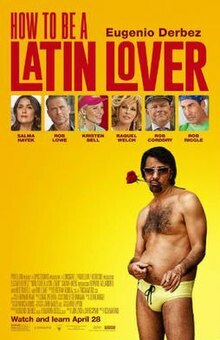 How to Be a Latin Lover has grossed $32.1 million in the United States and Canada and $29.7 million in other territories for a worldwide total of $61.9 million, against a production budget of $10 million. In North America, the film was released alongside The Circle, Sleight and Baahubali 2: The Conclusion, and was projected to gross about $7 million from 1,118 theaters in its opening weekend. The film ended up grossing $3.9 million on its first day and $12.3 million over the weekend, finishing second at the box office behind The Fate of the Furious. 89% of the opening weekend audience was Hispanic. The film grossed $5.1 million in its second weekend (a drop of 58%) and $3.9 million in its third (dropping just 25%), finishing 4th and 7th, respectively. On review aggregator website Rotten Tomatoes, the film has an approval rating of 38% based on 26 reviews, with an average rating of 4.9/10. On Metacritic the film has a score 54 out of 100, based on 11 critics, indicating "mixed or average reviews". Audiences polled by CinemaScore gave the film an average grade of "A" on an A+ to F scale. How to be a Latin Lover was released on Digital HD on August 1, 2017, and was released two weeks later on Blu-ray and DVD on August 15, 2017. A French remake entitled How to Be a French Lover [fr] (Just a Gigolo in French speaking markets) was released in 2019. The film was directed by Olivier Baroux, co-written by Baroux and Kad Merad, and stars Merad, Anne Charrier, Pascal Elbé and Thierry Lhermitte among others. ^ "How To Be A Latin Lover". 28 April 2017. ^ "2017 Feature Film Study" (PDF). FilmL.A. Feature Film Study: 24. August 2018. Retrieved August 9, 2018. ^ a b "How to Be a Latin Lover (2017)". Box Office Mojo. Retrieved August 5, 2017. ^ Fuente, Anna Marie de la (June 5, 2015). "Eugenio Derbez Buys Comedy to Star in, Direct (Exclusive)". Variety. Retrieved December 22, 2016. ^ Fuente, John Hopewell,Anna Marie de la (November 14, 2015). "Los Cabos: Eugenio Derbez Sets 'Latin Lover' as 'Instructions Not Included' Follow-Up (EXCLUSIVE)". Variety. Retrieved December 22, 2016. ^ Busch, Anita (October 26, 2015). "Ken Marino Set To Direct Eugenio Derbez In 'Latin Lover' For Lionsgate's Pantelion". Deadline Hollywood. Retrieved December 22, 2016. ^ Busch, Anita (April 28, 2016). "Rob Lowe, Kristen Bell Join Pantelion Comedy 'How To Be A Latin Lover'". Deadline Hollywood. Retrieved December 24, 2016. ^ McNary, Dave (May 11, 2016). "Eugenio Derbez Comedy 'How to Be a Latin Lover' Casts McKenna Grace". Variety. Retrieved January 23, 2017. ^ "Eugenio Derbez in How to Be a Latin Lover Trailer". ComingSoon.net. December 21, 2016. Retrieved December 22, 2016. ^ Pedersen, Erik (June 8, 2016). "Lionsgate Dates 'Granite Mountain', 'Wonder' & 'How To Be A Latin Lover' For 2017". Deadline Hollywood. Retrieved December 22, 2016. ^ "'How to Be a Latin Lover' Edges Tom Hanks' 'The Circle' at Thursday Box Office". Variety. April 28, 2016. ^ a b "'Latin Lover' Sets $12M Pantelion Record, 'Baahubali 2' Mighty With $10M+, 'Circle' A Square As 'F8' Leads Listless Weekend". Deadline Hollywood. Retrieved April 30, 2016. ^ Kelley, Seth (30 April 2017). "Box Office: 'Latin Lover' Tops 'The Circle,' 'Fate of the Furious' Rides to Third Straight No. 1". ^ "'King Arthur's Head cut Off With $14.7M Opening As 'snatched' Swims To $17.5M In A 'Guardians'-Ruled Mother's Day Weekend". Deadline Hollywood. May 15, 2017. ^ "How to Be a Latin Lover (2017)". Rotten Tomatoes. Retrieved August 12, 2017. ^ "How to Be a Latin Lover reviews". Metacritic. Retrieved May 3, 2017. ^ "How to Be a Latin Lover DVD Release Date August 15, 2017". DVDs Release Dates.